GED Blog » Fostering Economic Integration Through International Trade & Investment » Downgrading or Upgrading NAFTA? Negotiations on the North American Free Trade Agreement will go into the third round this weekend (23-27 September) in Ottawa. In the talks, which are always burdened by critical statements and Twitter messages from US President Donald Trump, however, all options still seem to be on the table. Both a successful modernization of the trade deal as well as a complete failure of the negotiations and a possible withdrawal from NAFTA are conceivable. In our recently published study on the possible effects of a failure of negotiations and a reintroduction of tariffs and non-tariff barriers in the North American free trade zone, it could be clearly shown that the real per capita income in the US would decrease in the long term by about 125 US$. Thus the US would harm not only Canada and Mexico but also itself. The result implies though that NAFTA has brought economic prosperity to US and all the other countries involved. But is this so? On the basis of the latest NAFTA impact and evaluation studies, we will summarize the main arguments. Here we are going to look at different dimensions of economic prosperity, meaning trade and investment, competitiveness, and productivity, as well as overall economic growth and welfare in terms of employment. In doing so, in particular we will focus on economic relations between Mexico and the United States. So … Has NAFTA improved overall economic prosperity? Using econometric models to determine the economic effects of trade agreements such as NAFTA is a complex task and can serve to give an approximation but never the truth itself. Moreover, many other factors have had a much greater impact on trade and investment and, along with them, the economic development of the partner countries, other than just changes in trade policy, especially in the case of NAFTA. These include first of all general developments such as the increasing use of technical innovations, above all in the form of growing automation in the manufacturing industry and long-term changes in world trade and the role of emerging markets – chief among them China. Global and regional economic crises and related recessions such as the U.S. economic recession in 2001, the significant depreciation of the Mexican peso at the end of the 1990s, and the global financial crisis in 2008 had also a significant impact on trade and investment activity. Nonetheless, far-reaching trade policy measures such as NAFTA have an impact on various dimensions of economic prosperity, and consequently on the development of trade and investment, competitiveness, growth and employment. Accordingly, we will examine these in more detail below. Has NAFTA increased trade and investment? First of all, there is no doubt that since its implementation, NAFTA has led to significantly greater trade and investment between its participating partner countries. Without the corresponding reduction of tariff and non-tariff barriers, this would not have been possible to the same extent. 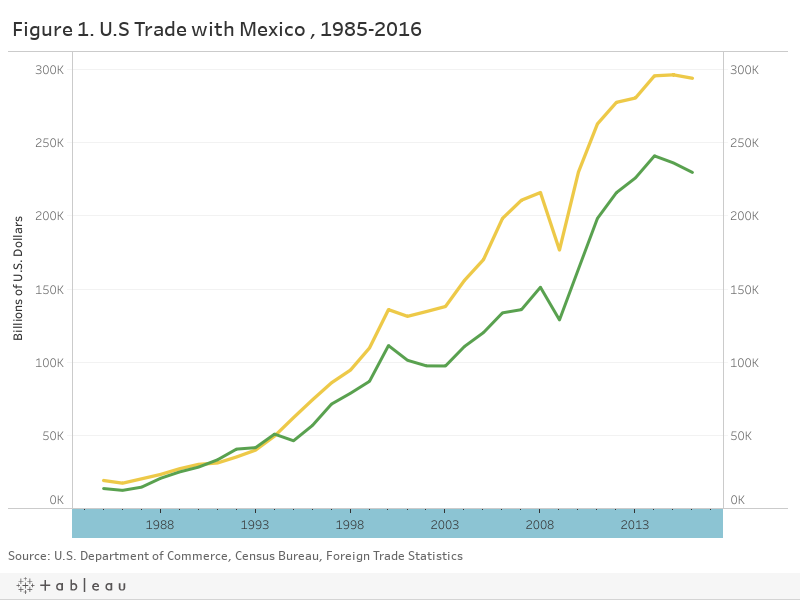 Thus from 1993 to today, U.S. trade with Mexico and Canada has virtually quintupled. In the meantime, every year goods and services of a value of over $1.1 billion move across the borders of the partner countries – whereas in 1993 this was only about $290 million. There is no other country in the world with which the United States, Mexico or Canada achieved such a strong growth in trade in the same time period; this too underlines the especially positive effect of NAFTA. Bilateral trade alone between the United States and Mexico has meanwhile reached a volume of around $600 billion ($584 billion in 2015) – and therefore in any single minute, on average over $1 million dollars of goods and services are traded between the two countries. Today, Canada and Mexico purchase more U.S. goods and services than any other country in the world. 34% of all U.S. exports go to these two partner countries. (Figure 1) By contrast, the United States is Mexico’s most important trading partner, accounting for 80% of its exports. Has NAFTA enhanced competiveness and productivity? NAFTA’s significant past and continuing impact on the competitiveness and productivity of the three partner countries can be attributed mainly to the deeply integrated supply and value chains that have formed between the countries. In the past 20 years very efficient production networks have developed across the partners’ borders, which is why they are also collectively referred to as “Fabric North America“ (R. Baldwin) or the “Regional Manufacturing Platform” (Chr. Wilson). Nowadays, goods and products are produced jointly – for example by Mexico and the United States – in several individual steps, so that their materials and semi-finished products move across the border several times. It is the manufacturing industry, such as the automotive and aerospace industries, that profit most from these cross-border chains. Analogous production networks have also developed in the area of agriculture. Wheat fodder from the United States is delivered to Mexico, where it is fed to animals, which then in turn go to the United States, where they are fattened and slaughtered for meat which can be exported abroad, including to Mexico. From these examples it is clear that, contrary to expectations, the countries no longer focus on different product areas or industries, but rather on specific production processes within the same product categories – especially in the manufacturing sector. As a result, the four most important product areas for the United States for export to Mexico are also Mexico’s four most important product areas for export to the United States: machinery, vehicles, electrical machinery, and mineral fuels. Apart from Canada, the United States does not conduct more intensive intra-industry trade with any other country in the world. Supported by structural reforms since the beginning of the 1990s, Mexico has not only succeeded in integrating itself into North American production and value chains, but also in aligning its economic structure more strongly to the more profitable manufacturing sector and, in doing so, is competitive on a worldwide basis in many areas. This can be readily seen in the automobile industry. That industry’s share of Mexican GDP at the beginning of the 1990s was 1.9%, whereas today it amounts to 3.4% (2015). Mexico is now the seventh-largest automobile producer and the fourth-largest automobile exporter, behind Germany, Japan and Korea. The multifaceted exchange of intermediate products that cross the Mexican border has drastically changed the type of trade between the two NAFTA countries. By using concrete input-output trade data some studies show that 40% of the value of goods imported from Mexico to the US is actually “Made in USA” and thus consisting of products that have previously been exported to Mexico from the US. In sum the deeply integrated supply chains that have formed between Mexico and the US have become a major driving factor for improving international competitiveness of US and Mexican companies, generating corresponding income and revenue on both sides of the border. And NAFTA has clearly facilitated and pushed this development. Has NAFTA improved economic growth and employment? As to the extent to which NAFTA also contributed to a higher national income and a better employment situation, it is difficult to say, since many factors and developments play a role. In addition, economic gains such as jobs that have been created or made more secure, higher salaries, lower consumer prices and better product quality are often not adequately set off against economic losses such as jobs lost and lower salaries in certain sectors, but instead are treated only in an isolated way. With regard to the United States, most studies conclude that NAFTA has had only a fairly moderate, but still positive, effect on economic growth in the United States – assuming a gain of less than 0.5% of GDP. The essentially rather limited effect on income is to be attributed to the fact that in 1994, trade with Mexico and Canada, which was 5%, accounted for only a small percentage of U.S. GDP. Trade with Mexico in that year amounted to only 1.4% of GDP. According to a study by the Petersen Institute for International Economics (2014), in the United States trade due to NAFTA has so far contributed an additional $127 billion each year to national income – which means around $400 per year for each American. Furthermore, in the next few years this additional national income is expected to remain the same or even increase, so that NAFTA indeed will have probably raised U.S. economic growth to only a limited degree, however to a higher level over the long term. In contrast, NAFTA’s effects on the employment situation in the United States are complex, which is why the results of the calculations in various studies are to some extent widely divergent. Critics of NAFTA – first and foremost President Donald Trump – point out that the high growth in Mexican imports and the negative trade balance associated with it have led to substantial job losses, above all in the manufacturing industry. 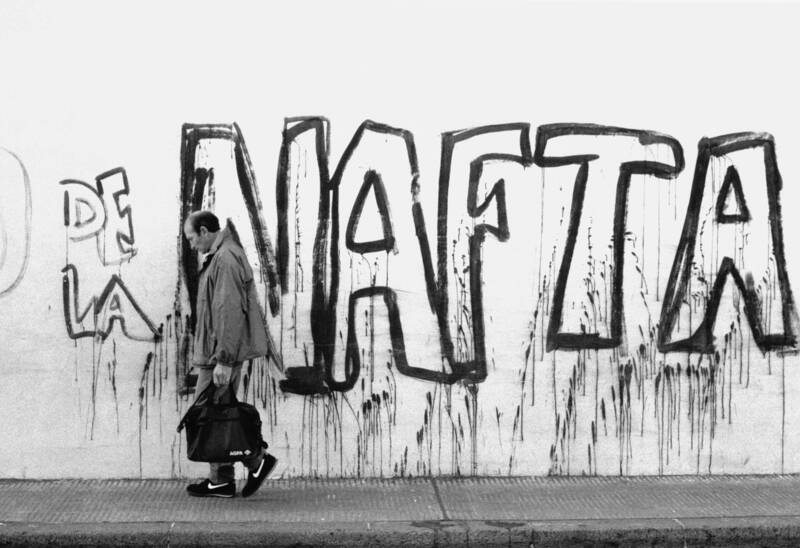 NAFTA is repeatedly cited as the main “job killer” in the manufacturing industry, especially in the automobile industry, where over 350,000 jobs have been lost since 1994. However, several arguments can be made in opposition to put this in perspective. First, the trade balance does not take into account the intensive and multifaceted exchange of intermediate products that cross the Mexican border. As mentioned above, Mexican exports to the United States include up to 40% of the intermediate products that have previously been exported to Mexico. Moreover, inferring total national economic effects from bilateral trade balances is generally not productive, since these make sense only in a multilateral context. Furthermore, a greater number of lower-priced, higher-quality product imports from Mexico have made many companies in the United States internationally competitive for the first time, which is why they can maintain or increase exports to other countries. Finally, according to Gary Hufbauer, there is not even a statistical connection between a negative trade balance and negative employment trends. In a nutshell NAFTA significantly contributed to greater trade and investment between its participating partner countries. The free trade deal also improved international competitiveness of US and Mexican companies and business sectors on both sides of the border through highly effective and integrated regional supply chains that have formed between both countries. Lower trade costs and higher productivity have also led to significant growth as measured in GDP per capita in the US. But whether all this led to more or better employment in terms of higher salaries or more safe jobs is still intensively debated as calculating or estimating corresponding effects on the job market is particularly complex. According Gary Hufbauer “trade agreements have little net effect on the level of national employment but do contribute to the overall “churn” in the job market.” But this is of course just the net effect on overall employment. There is no doubt that NAFTA contributed to higher competitive pressure resulting in job displacements within particular industries in the US and Mexico. And in the analysis within our Crossroads video series on Mexican and US trade relations we took a closer look at those industries and the affected people on both sides of the border. It is however also debatable if NAFTA is in general to blame for potential negative effects on employment or rather the lack of efficient adjustment policies and structural government programs going along with trade liberalisation agreements. It has become quite obvious that existing government programs in the US and Mexico have been inadequate to absorb job displacements caused by competitive constraints, which of course have been intensified by NAFTA. Angeles Villarreal, M. / Fergusson, I. F. (2017): The North American Free Trade Agreement (NAFTA), Congressional Research Service, February 22, 2017. Biondi, Filippo (2017): The Mexican automotive industry and Trump’s USA, Blogpost, Breugel.org. Congressional Budget Office of the United States, “The Effects of NAFTA on U.S.-Mexican Trade and GDP,” A CBO Paper, May 2003, p. xiv. Hansen, G.H. (2010): Why Isn’t Mexico Rich?  in: Journal of Ecomomic Literature. Lorenzo Caliendo and Fernando Parro, Estimates of the Trade and Welfare Effects of NAFTA, National Bureau of Economic Research, November 2012, pp. 1-5. Moran, Theodore H. /Oldesnki, Lindsay (2014): How U.S. Investments in Mexico have increased investment and jobs at home” in NAFTA 20 Years Later, Washington, DC: Petersen Institute for International Economics, November 2014. Parilla, Joseph (2017): How US states rely on the NAFTA supply chain, in: The Avenue, Brookings 2017. David Autor, David Dorn, and Gordon Hanson weigh the impact of trade with China and Mexico on the U.S. labor market in this 2016 National Bureau of Economic Research paper. USITC, “The Impact of Trade Agreements: Effect of the Tokyo Round, U.S.-Israel FTA, U.S.-Canada FTA, NAFTA, and the Uruguay Round on the U.S. Economy,” Publication 3621, August 2003. Wilson, Christopher E. (2017): Charting a new Course: Policy Options for the Next Stage in U.S.-Mexico Relations, Leveraging the US-Mexico Relationship to strengthen our economies.